interpretations of natural forms combine elegant design with rich, vivid color creating original, one-of- a-kind hand-blown glass art. A master colorist, Sutherland’s work is recognized for its distinctive color-combinations and ardently developed formulas, offering dazzling art that simply commands to be looked at. His unique style has produced an exceptional body of work that is sought after by galleries, garnered first-place awards in heavily juried exhibitions, and created stunning installations for private collectors. A San Diego native inspired by California’s vibrant Mediterranean climate. After earning his degree in Fine Arts from California State University in Chico, he developed his skills at Orient and Flume, one of the pioneering glassblowing studios in the United States. He then studied in New York with Bill Gudenrath, master Venetian glass artist, at the prestigious Corning Museum of Glass where he was invited back as teaching assistant. He continued to master his craft at the renowned international center for glass art education - Pilchuck Glass School founded by Dale Chihuly in Stanwood Washington before opening his own studio in Northern California. The Sutherland Studio is built on what was once the largest peach and pumpkin cannery in the world…The Libby Cannery. Since 1932, Libby’s was the single largest employer in the town of Gridley, a small agricultural town in northern California. Libby ceased operations there in 2001 leaving behind a 25 acre industrial "ghost town". It was out of the factory rubble left behind that the Sutherland Studio emerged. Renting a small section of the enormous property, the site was cleared, remodeled and equipped. Former Libby employees even pitched in to help with the construction. In recognition of the sites’ history “Fizzle Fruit©” was created. The bubbly, fizzy exquisite glass fruit symbolically rekindles the energy of times past when the cannery was alive and thriving. Fizzle Fruit© honors this rich history while keeping its legacy alive. 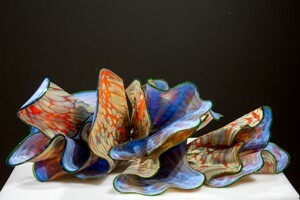 Artist Statement: interpretations of natural forms combine elegant design with rich, vivid color creating original, one-of- a-kind hand-blown glass art. About: A master colorist, Sutherland’s work is recognized for its distinctive color-combinations and ardently developed formulas, offering dazzling art that simply commands to be looked at. His unique style has produced an exceptional body of work that is sought after by galleries, garnered first-place awards in heavily juried exhibitions, and created stunning installations for private collectors. A San Diego native inspired by California’s vibrant Mediterranean climate. 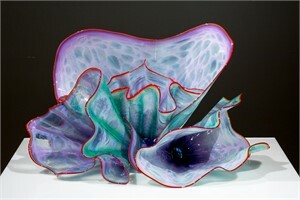 After earning his degree in Fine Arts from California State University in Chico, he developed his skills at Orient and Flume, one of the pioneering glassblowing studios in the United States. He then studied in New York with Bill Gudenrath, master Venetian glass artist, at the prestigious Corning Museum of Glass where he was invited back as teaching assistant. He continued to master his craft at the renowned international center for glass art education - Pilchuck Glass School founded by Dale Chihuly in Stanwood Washington before opening his own studio in Northern California. Studio History: The Sutherland Studio is built on what was once the largest peach and pumpkin cannery in the world…The Libby Cannery. Since 1932, Libby’s was the single largest employer in the town of Gridley, a small agricultural town in northern California. Libby ceased operations there in 2001 leaving behind a 25 acre industrial "ghost town". It was out of the factory rubble left behind that the Sutherland Studio emerged. Renting a small section of the enormous property, the site was cleared, remodeled and equipped. Former Libby employees even pitched in to help with the construction. In recognition of the sites’ history “Fizzle Fruit©” was created. The bubbly, fizzy exquisite glass fruit symbolically rekindles the energy of times past when the cannery was alive and thriving. Fizzle Fruit© honors this rich history while keeping its legacy alive.